Myanmar’s opening has made its growing strategic value to major powers even more evident. After 49 years of limited interaction with the international community, Myanmar is fast becoming a valuable strategic and economic partner for various regional stakeholders as it gradually relaxes its strong military rule. While the United States previously chose to isolate and punish the military-led regime through political and economic sanctions, China has been the most engaged with Myanmar’s military junta. Meanwhile, India and the Association of South East Asian Nations (ASEAN) opted to use constructive engagement with the country. Now that Myanmar is opening its doors, its growing significance is becoming more and more evident. With its untapped natural resources, large potential of its nascent markets and strategic geographic location connecting South and Southeast Asia (and mainland China), external powers are expected to increasingly engage with Myanmar. They are transforming their once restricted interactions with Myanmar towards more collaborative endeavors. Myanmar can be a commercial highway from South Asia to Southeast Asia and mainland China to Southeast Asia. It is also a country where other states have an interest to curtail Chinese influence and hence may be the next field for geopolitical competition among major powers. The turnover of power from the military to a quasi-civilian government in Myanmar prompted various external actors to review and renew relations with the country. For instance, the United States restored international trade for most items, eased investment-related sanctions, revitalized bilateral relations with the mutual exchange of ambassadors, allowed the return of USAID mission, relaxed the visa bans against Myanmar officials, and supported Myanmar’s ASEAN chairmanship. This has greatly benefited Myanmar which suffered after a long period of economic and political isolation caused by restricted operations of multinational corporations in the country and the limited interaction of its government with international organizations. The United States has been receptive of Myanmar’s changing domestic landscape and evolving role in the region. In fact, the US government has been an advocate for Myanmar’s path towards democracy in recent years – lending its support for the country’s constitutional reforms and improvement in human rights conditions, as well as calling on Myanmar’s military to exercise neutrality in political affairs. However, the U.S. Congress is reluctant to provide further support for Myanmar, such as security assistance, due to its slow reforms and inability to address the statelessness of the Rohingya population. Because of this, the United States is expected to raise these reform issues with Myanmar and keep track of such reforms. While Myanmar is in the process of normalizing ties with the United States following a long period of estrangement, its relations with China, however, is at a reverse. From being the closest external partner during Myanmar’s isolation from the West, China’s diplomatic influence is slowly decreasing due to the changing domestic situation. China will have to deal with the growing Burmese nationalism and rising anti-Chinese sentiments linked to the oppressive and exploitative nature of its projects affecting Myanmar’s natural resources and its local people. Despite its negative implications, China’s economic influence will remain because of its substantial investments in infrastructure projects and in industrial and manufacturing imports in the country. According to the Directorate of Investment and Company Administration of Myanmar, as of 30 April 2015, China’s investments amounted around 26 percent of the total foreign investments, making it the largest investor in Myanmar. With Myanmar’s economic development, more Chinese businesses are expected to increase their presence in the manufacturing, telecommunications, hotel and tourism sectors, as well as increase their investments in power generation and oil and gas projects in the country. In the long term, China is expected to strengthen its economic influence to gain access to Myanmar’s raw materials and energy resources as the Chinese economy expands. It also seeks to fuel the economic growth of its landlocked and impoverish western provinces, particularly in Yunnan. Since Myanmar is a neighboring state, China’s strategy appears to be geared towards narrowing the economic imbalance between its eastern and western provinces. Aside from its economic value, Myanmar’s strategic location serves as an important link for China’s market expansion in South and Southeast Asia. However, there are border security issues that China needs to deal with in order to fully maximize Myanmar’s strategic value. For instance, in March 2015, Myanmar’s Air Force retaliated on the ethnic Kokang Myanmar National Democratic Alliance Army by dropping a bomb that landed in the sugarcane field in Yunnan, killing four Chinese. Such incidences of armed conflict between the Burmese military and armed ethnic groups that spill over along China’s borders has prompted the Chinese government to diplomatically pressure Myanmar to address this issue. Continuous engagement with India could lessen China’s influence in Myanmar. Aside from being an alternative trade route to Southeast Asia, Myanmar is considered a possible source of energy for India. This is because Myanmar has approximately 3.2 billion barrels of recoverable crude oil and an estimated gas reserve of 2.5 trillion cubic meters, making it the 10th largest in the world. But due to its lack of import mechanisms for Myanmar’s gas, India has not yet fully capitalized on its present investments unlike its Chinese counterpart. In addition, ties between India and Myanmar are expected to improve the local economies in India’s northeastern borders. Like China, India’s shared land borders with Myanmar are considered undeveloped and unstable because of rural poverty and the influx of illegal arms and drug trade. Thus, establishing economic cooperation with Myanmar presents an opportunity for India’s northeastern borders to develop through cross-border trade. 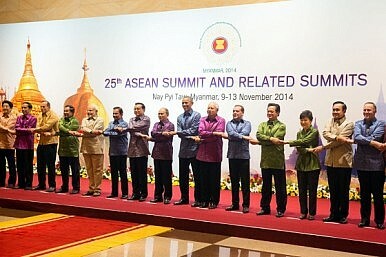 ASEAN showed greater respect for Myanmar after its commendable efforts during its chairmanship in 2014. For the ASEAN member states, Myanmar effectively led the regional organization as chair and successfully hosted the annual summit, despite logistical challenges and the various human rights issues that hounded the country during its chairmanship. Moreover, ASEAN views Myanmar’s political and economic reforms as favorable since these would provide stability in the country and in the region. However, in the context of regional integration, Myanmar must deal with the synchronization of its domestic policies and the improvement of its infrastructures to further boost the organization’s credibility in leading the integration towards one cohesive community. What’s at stake for Myanmar? The changing domestic and geopolitical realities in Myanmar have contributed to its increased significance. External actors see benefit in engaging Myanmar for its geostrategic location and economic potential. In the long term, these states will significantly expand their influence in the country. For its part, Myanmar must be able to effectively work together with them and be able to strategically balance their competing interests with its national interests; otherwise, it would be the least to benefit from the situation. It has no other choice but to cautiously engage with these states in order to safeguard its interests. This should prompt Myanmar to develop a balanced foreign policy that maintains cordial relations in its neighborhood. This is critical as it seeks to restore its regional standing and project itself as a responsible stakeholder in the international community. The diversification of its external partnerships and the proactive engagement in its foreign policy will allow Myanmar to reassert its independence and subsequently maximize its strategic and economic options. While its external relations have recently improved due to its political reforms, Myanmar should continue with the development of its domestic policies. It needs to develop both its physical and institutional infrastructures, harmonize its policies, and strengthen its national and local institutions to be able to take full advantage of the gains from its international engagements and regional integration. It must also remain committed to its reforms and guarantee socio-political stability by neutralizing the strong grip of military rulers, minimizing armed ethnic conflicts, and addressing human rights issues which are all crucial determinants of greater financial and diplomatic support from the international community, particularly from the west. Ultimately, the robustness of Myanmar’s domestic and constitutional reforms, which reflect its commitment to a consolidated democracy, will be vital in its foreign policy. Jeremie P. Credo is a Foreign Affairs Research Specialist with the Center for International Relations and Strategic Studies (CIRSS) of the Foreign Service Institute in the Philippines. This was originally published as a CIRSS commentary here. Myanmar's government has played its cards well in the U.S.-China competition for influence.